Who: Intermediate to advanced DH riders wanting to improve. What: Jumps, drops and legit DH trails, all within an hour from the beach break. Add in quality coaching, ocean-front accommodations and an emerging, passionate mountain bike community and you have one sweet trip! Our bike program will be a mix of trail skill sessions and shuttled DH runs. Over the course of six riding days, we'll visit four distinct zones. The trails and terrain will be a mix of fast and rugged with loose technical to advanced, black diamond 'Dirt Merchant’ sized jump runs (not featured in our 2013 Girl Trip edit). We'll refine and advance your overall riding to make every trail, jump and nemesis move feel more effortless and smooth. SAG, body position, advanced braking, various cornering and technical terrain techniques, how to find trail speed as well as some jump and drop refinement will be the main skills covered. We'll ride through various coffee fields, down different mountains and visit the volcanoes trails until we say, “mercy!” or until the sun sets. 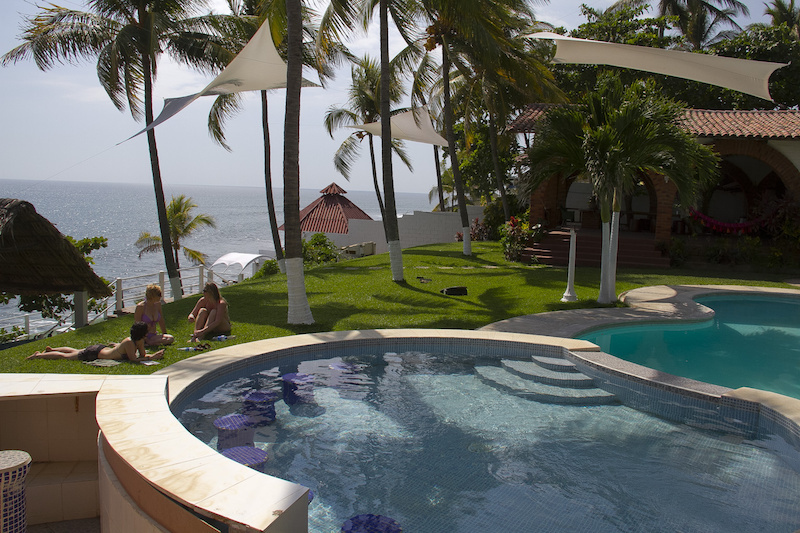 The trip will base out of Punta Elephante, an ocean-side guest home near the popular surf destination El Tunco. 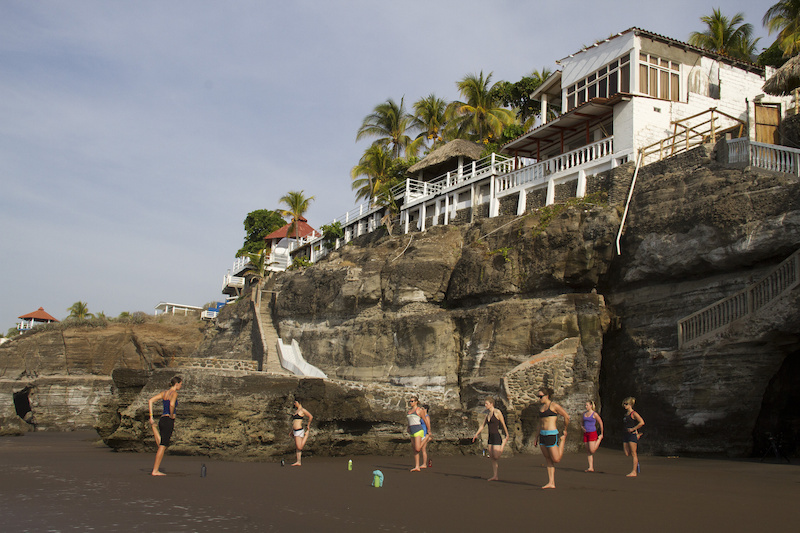 Herbert Baiza and his Salvadorian family's hospitality at Punta Elephante is genuine and from the heart. From our hearty local breakfast to our daily house ceviche, you will be amazed and feel right at home. Suni Apter, El Salvador National Surf and Fitness trainer will be around Punta Elephante for those in need of a post-ride massage. 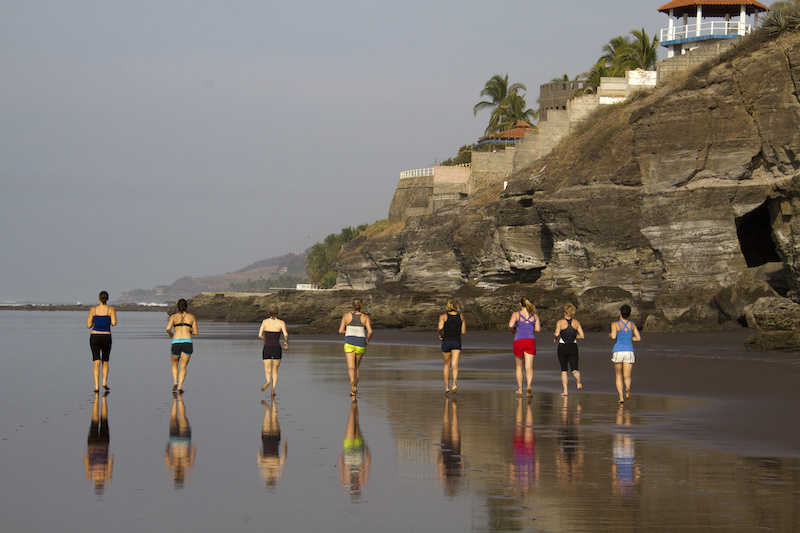 Suni will also join the Girls Trip to lead our Core Yoga Class on the private beach below our home. If the Coed trip wants some morning core yoga, we can make that happen too. Maintaining joint mobility and a strong core will keep you shredding hard for many years to come. The mountain bike trip, the community, the place, and the adventure is truly a dream! Note - Giving back and leaving trails better than we found them is a huge part of how lbBikes.com rolls. Part of our trip costs go directly back into the local community living in or around coffee field trail. With permission from the local Coffee Field owners, we hire the locals who live on, or use the non traditional trail network we ride. 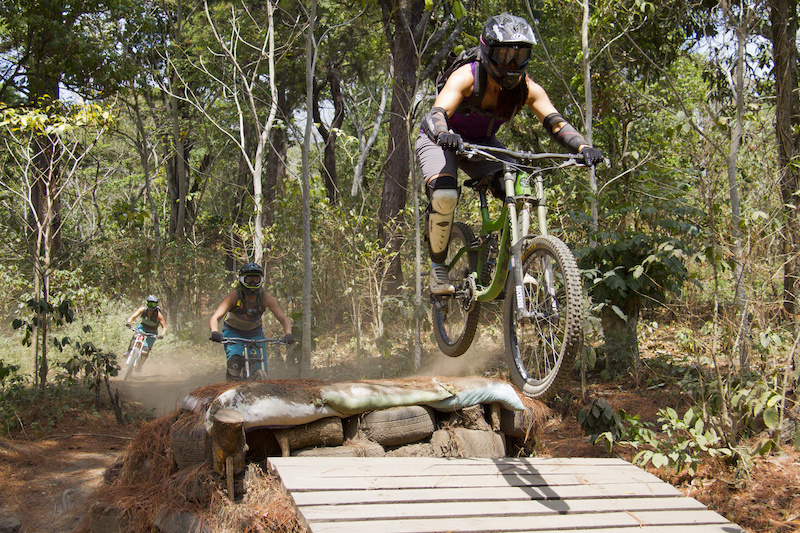 Trip proceeds also help build and maintain El Salvador’s Bike Park in San Salvador. Lorraine Blancher, aka LB is the coach for the trips. To meet her before you go, check her coaching bio, athlete rider bio or mini rider video clip. Gato our local El Salvador Guide and 2012 National DH Champion will also join you on some of the rides. Contact LB at lbBikes.com if you want to secure your spot - these trips fill fast! Many thanks to Race Face, Specialized Canada, FOX Racing Shox, Clif Bar, Troy Lee Design Helmets, Oakley and Toyota BC for making the above trip and other lbBikes experiences what they are. I appreciate the support and look forward to seeing what can be created next !! 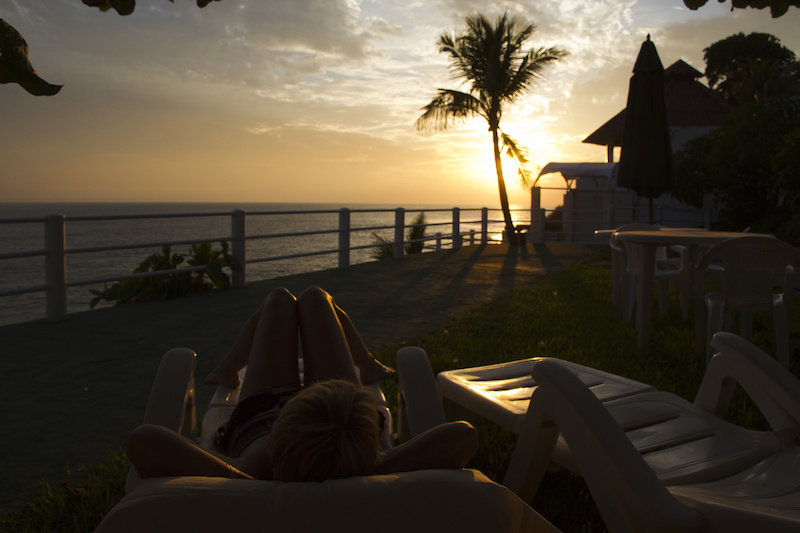 I hope this really takes off, I was just in El Salvador and its an amazing place with some of the nicest people. Just wish I knew there was DH when I was in El Tunco last month! Nice work, LB. One of these days I'll join you. as having been a part of this fantastic El Salvadorian experience, I totally recommend it to all riders!!! You won't regret it!! 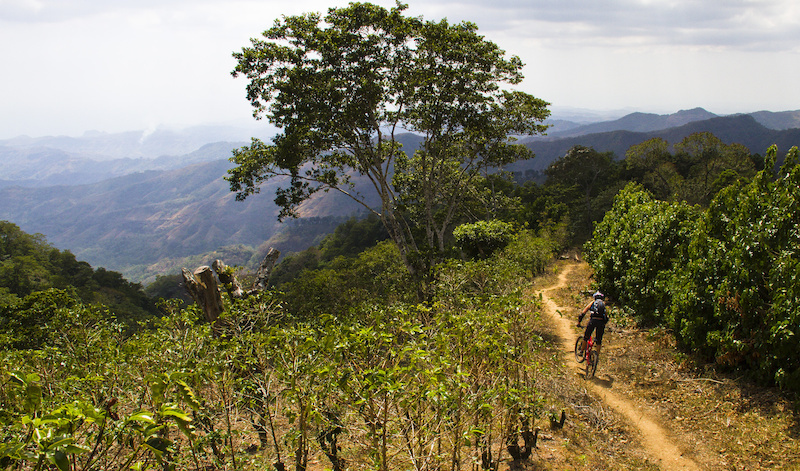 Some footage about one of the best Salvadorians DH PRO riders sending the same trails. Nice! My partner went on this trip last year and had an absolute blast! I was pretty jealous the whole time. Got a good thing going, Lorraine! that looks fun! my wife is Salvoradian. We may just have to visit there soon. I would love to go there - more for the surf - but I'm afraid of the crime. My friends went and got robbed just walking back up the point by guys waiting for surfers, which is apparently a common occurrence. Looks like a girls trip with girls in every picture. Dh during day ,,,, women during night .... Gone to heaven !!!! ps, I got sick there and had a great medical service!!! This would get way more views if it was called the dirty girls of El Salvador. I learned the most from Lorraine at the SGC - she's a great coach! Ok this trip looks so awesome! Obviously no rider ever wants to get hurt, whether you’re at home of afar. The emergency action plan for this trip includes the direct cell number to a General Surgeon and his private clinic in San Salvador. The surgeon and his professional team is my first call and they will arrange what we need, anything from an ambulance to MRIs (yes on the spot MRIs). Although some of the Country is below what we'd call poverty, there is a thriving professional and medical community. AND Unlike Canada or the US, his clinic rates are better that the local hospitals too. Again, no one ever wants to get hurt ... El Salvador has world class medical facilities and our trip EAP is well thought out. an helicopter, and someone ask or affirm that the emergency blanket is not that expensive, remember. Are you always this negative and xenophobic? I'm sorry you're right, too much negativity. Looks like a beautiful ride but I agree, in these South American countries, a dream like that can turn into a real nightmare if you get injured during a ride. Often times the hospitals will refuse service if you can't pay, even if it means you will die if you don't have the funds to pay the doctors. They don't care how hurt you are, pay up first if you want treatment. That's bs. People there will do whatever they can to help you. i second that! see below - big smile. Jeez rocky scare everyone off why don't you. Also El Salvador is in Central America. And people there are amazing. I was on a trip in one of "these South American countries" when my friend suffered a traumatic brain injury. While the injury sucked something fierce, the medical treatment he received was incredible, even when we were in a remote location and what would be considered under-developed conditions. We did not have to pay up front, but having trip insurance (which cost a mere $50 per person for a 10 day excursion) was an absolute (and literal) life saver. Making claims like that is unfair. I'm sure it's not perfect everywhere in South America, but these are people with a conscience and dedication to helping anyone who comes through their doors.